Deodorants: An everyday necessity these deodorant sets will make for a good Diwali gift option for you, you don’t have to think twice in case you are not sure about what should you present to your near and dear ones in gift items for men in less than 500. 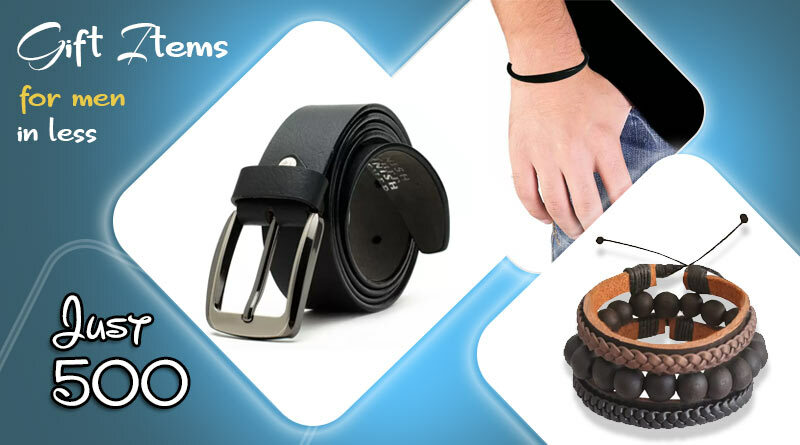 Belts: Another everyday use item for men, even though they can also be unisex items. These belts will help complete your look, you can choose one for yourself or a dear one for this Diwali, It will be a useful item that won’t prick your pocket also. You can also choose a gift pack which includes other useful items like a wallet, card holder etc. Wallets: If you are looking for an elegant gift item to show to your man that you care about his needs too then these wallets will make for a nice option for him, at the same time it is also believed that when you gift a person a wallet, you wish for them wealth and prosperity. Jewellery Items: Who said Jewellery is only for women, men too nowadays flaunt classic pieces that not only makes them stand out but also reveal their personalities and eccentricities. You can now choose from items like bracelets, stud earrings, rings, Kada (bangle for men), etc. Scarfs and Suspenders: Many men like to sport a scarf and it undoubtedly makes one outshine with a scarf that is worn properly. You can also choose from other accessories like bow ties and suspenders that can add to your overall look with just a small addition. For more details on gift items for men in less than 500 and related updates, like and subscribe to tentaran.com.